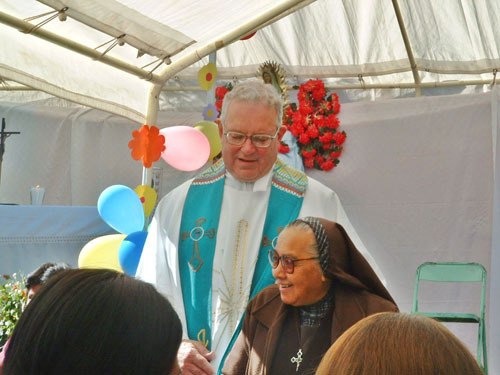 It was June of 1990 when Father Pat Rush led a group of St. Thomas More parishioners to the small mountain village of San Andres Itzapa , Guatemala. With assistance and guidance from the Christian Foundation for Children and Aging (CFCA), STM joined hands with Padre Pancho, the pastor at the cathedral in San Andreas, Madre Marina , founder of the Carmelite order whose convent is located there and the people of the community to begin a relationship that continues today after 23 years. Padre Pancho had a vision for that small village of predominately Mayan people who had been the victims of prejudice and civil war for many years. He had witnessed the needs of the people for better nutrition, health care, skills training and education. He believed that a partnership between the two communities could provide the assistance needed for the poorest of the poor in Guatemala to have a better life. In 1992, Father Bill Bauman became pastor of STM and embraced the relationship formed with our sisters and brothers in Guatemala. Because of a difference in opinion between the leadership of the small school that had served the needs of the San Andreas’ children, the Mayan children could no longer attend the school and live their culture. 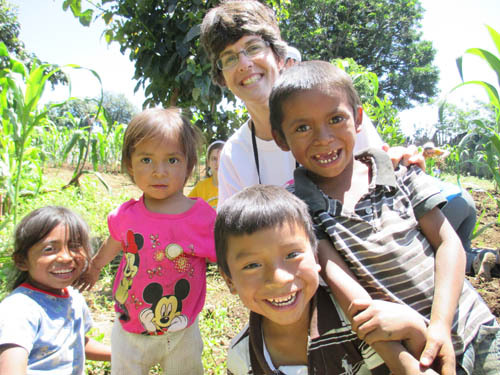 Seeing the pain this created, Father Bill established a relationship with a new visionary to build another school , San Bartolome , that provided a Catholic education for the Mayan children in their native language. Through the years, St. Thomas More has continued to support that school which now educates over 650 children and is fully subsidized by the government, teaching the children in their native Mayan language. We have also broadened our reach by helping two more schools, who serve the impoverished children in the mountains of Itzapa, provide the precious gift of education. Padre Pancho died years ago. Our parish community continues to reach out to the ever-changing priests that are assigned to the parish. STM parishioners have learned through the years that there is a source of continuity that serves as the heart of the community in Madre Marina and the sisters of the Carmelite community. The present pastor has requested that the religious education of the children not be taught in the school. These women, who tirelessly serve the poorest of poor and offer hospitality to all God’s children, have now opened their doors to the children teaching them religion, typing and other skills to assist them as they face the ever challenging circumstances of their daily lives. For many years, Joe Spallito led a team of dentists on an annual trip to address the community’s dental needs that were and continue to be overwhelming. Our parish continues to support the orphanage for children with special needs who, without this home, would be left on the streets to die. Many years ago, Shannon Ervin, daughter of former parishioners Jed and Sharon Ervin, adopted a little boy named Maynor Estuardo Tagual Siguinajay through CFCA. While working in the fields, Maynor’s father had been murdered during the Civil War. Along with his 6 siblings, he attended the school STM sponsors and was raised by his mother who had no education, nor training to support her family. Many parishioners have watched Maynor grow up, finish college, get married and bring three beautiful babies into this world. Fr. Don once made the comment, after meeting Maynor, that he was one of the very rare people that had a “pure heart”. Maynor is filled with the love of Christ, love for his community and love of life. In January of 2013, Maynor identified community needs and founded the Share the Change program.